Wednesday’s terrorist attack in Tel Aviv, which left four Israelis dead and 16 more wounded, is generating predictable, but disturbing reactions. There was the requisite handing out of sweets to celebrate the attack among Palestinians and their supporters. The official Facebook page for the Fatah party, which is home to Palestinian Authority President Mahmoud Abbas, called the victims who were gunned down in the heart of Tel Aviv “settlers,” the Elder of Ziyon blog noted. People in Tel Aviv are settlers only in the eyes of those who believe Israel has no right to exist. The PA supposedly accepted Israel as part of the 1993 Oslo Accords, but Abbas repeatedly has refused to accept it as a Jewish state. The International Union of Muslim Scholars, led by Muslim Brotherhood spiritual guide Yusuf al-Qaradawi, posted a brief video on its Twitter feed. With hashtags “al Quds” (Jerusalem), “Intifada,” and “Ramadan,” the video shows bullets placed over a map of “Palestine” which covers all of Israel. The call to prayer is heard as a gun is shown with dates. During the month of Ramadan, Muslims traditionally break the fast with a handful of dates before heading off to the evening prayer. American Islamists consider Qaradawi a moderate and a respected scholar. Those Islamist voices, including officials at the Council on American-Islamic Relations (CAIR), have been silent about the Tel Aviv attack. As we have noted, those groups manage to overcome their reticence in rare cases in which Israelis attack Palestinian civilians. In those cases, Israeli leaders across the political spectrum quickly condemn the violence. 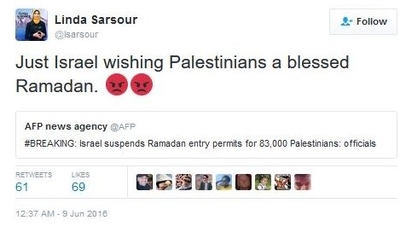 Another prominent Islamist, Arab American Association of New York Executive Director Linda Sarsour, expressed outrage at a report that Israel was suspending entry permits for Palestinians, casting the move as a slap during Ramadan, rather than as a security step in the wake of the attacks. Some of Israel’s enemies were more direct. Hamas promised more bloodshed for Israeli civilians. If all this is meant to frighten Israelis and send them cowering into their homes, it didn’t work. The scene of the terrorist attack, the Sarona Market, was open for business Thursday, again crowded with diners.